The property information shown below is for 2019 holidays. For 2018, simply click here. The property information shown below is for 2019 holidays. For 2016, simply click here. 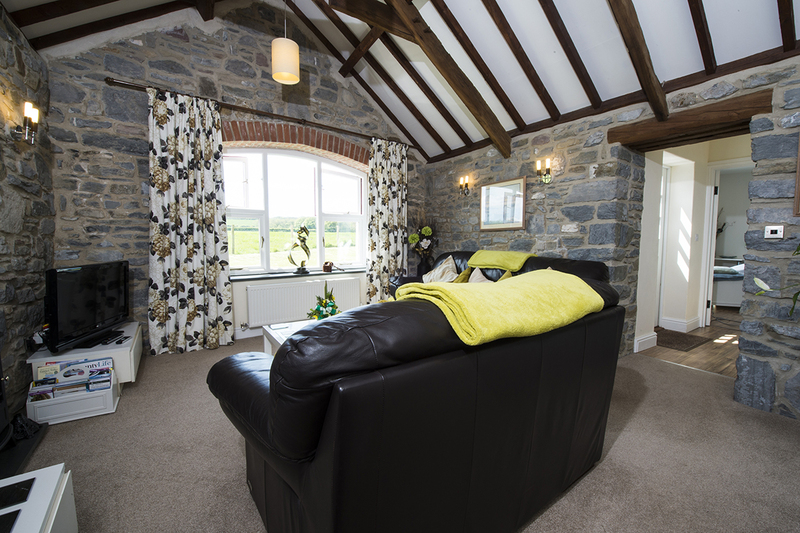 Silk Purse is a beautifully converted stone barn brimming with character with exposed stone walls and A-frame beams set in the heart of the waterside village of Angle in the Pembrokeshire Coast National Park. One of five cottages, and forming part of an original farmyard set back from the main street, it has been finished to a high standard throughout with interesting artwork and tasteful furnishings and décor. The spacious, modern fitted kitchen/diner is well-equipped, steps lead up and into the separate sitting room, a cosy retreat on chillier evenings. 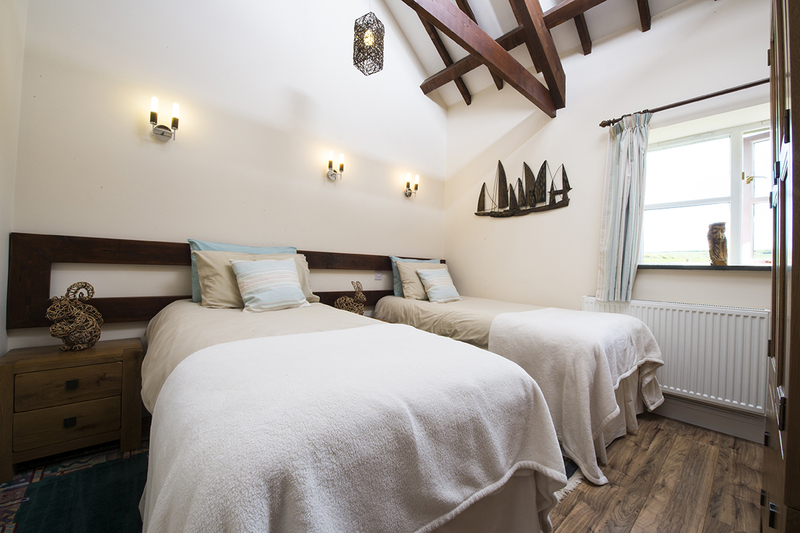 While the 2 well-appointed bedrooms both with ensuites complete this charming cottage. A door leads out to a small secluded patio, a veritable sun trap where you can relax. 2 steps take you up to a gated meadow garden which overlooks a green mosaic of pasture land and uninterrupted rural views. A short stroll takes you to the village pub nearby, as well as West Angle Bay a superb sandy beach, popular with holidaymakers with its beachside café, Wave Crest, where you can enjoy an excellent Sunday lunch. Join the Pembrokeshire Coastal Path to explore this stunning coastline, a stop at the The Old Point House for a pint overlooking the water should not be missed, all within an easy walk. There are a range of stunning beaches within easy reach including Freshwater West, one of the wildest beaches in Pembrokeshire, famed for its surf, long, golden beach, and its high, sheltered sand dunes - the perfect film set for blockbusters "Robin Hood" and "Harry Potter and the Deathly Hallows" in 2009. It is popular with surfers and dog walkers; enjoy refreshments at the beachside hut - Café Mor. Take a drive to Bosherston, walk round the Lilly Ponds onto Broadhaven South beach, while away in the village, stop at the Ye Olde Worlde Cafe for traditional afternoon tea or St Govan’s Inn for something stronger. The area is renowned for the variety of its bird colonies - guillemots, razorbills, cormorants, coughs, gannets, puffins and many more. Take in the Green Bridge of Wales and the medieval St Govan’s Chapel, built in to the cliffs as you explore the Coastal Path round. Silk Purse is a perfect retreat whatever the season for couples and families alike. Please ensure your read our access statement for this cottage in the tab above for more information, however if you are still unsure whether the property will be suitable for your needs, don't hesitate to call us on 01437 765 765 to discuss your specific requirements. 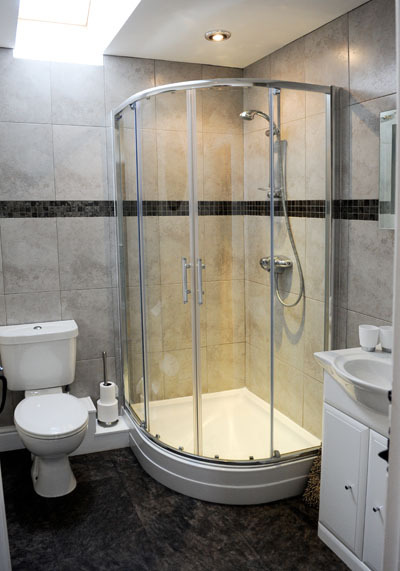 Ground Floor: Hall, twin room/ensuite shower room/whb/wc, kitchen/diner, 3 steps to lounge, hall, double room/king size bed/ensuite bathroom/overhead shower/whb/wc. Utility in outhouse. Heating: Oil central heating, electric ‘woodburning’ style fire. Electricity: & Oil: £20 per week Oct - April, free May - Sept.
Facilities: Electric hob and oven, microwave, fridge, freezer, dishwasher, washing machine, tumble dryer, TV, DVD player, CD player/radio, WiFi, towels, garden furniture. Pets: 1 small well behaved. Coastal Concierge is here to make your Pembrokeshire holiday a special one. Milford Haven Golf Club was formed in 1913 and opened as an enjoyable nine-hole offering, but has since been extended to a full set of 18 holes. This course is a test of skills, wit and patience, and is enjoyable by hundreds of visitors every year. The clubhouse features an upstairs bar where you can sit back and relax, sip your chosen vintage from the well-stocked bar and enjoy the splendid views across the course while deciding on what to choose form the extensive menu. Phoenix Bowl is an undercover centre which offers Ten pin bowling and soft play. Its a lively ten-lane bowling centre offering fun for everyone regardless of age or ability. Pirate Pete's is an Adventure play, is all about providing non stop fun for youngsters and a relaxing time for parents which costs £3.50 per child for an all day pass. They have fully licensed bar, providing a relaxed environment with big TV screen covering popular sporting events all year round. They have a fast food diner, which is perfect to have a leisurely bite to eat or to enjoy a drink with friends before or after your bowling session. At Milford Waterfront, they are building a future upon our history and creating a vibrant waterfront destination to welcome the world! Milford Waterfront is a great place for a day out! With boutique shopping, leisurely coffees with a great view, delicious food at one of the many cafés or restaurants, boat trips, Milford Haven Museum, galleries, a bowling alley, hair and beauty salons and a marina, there’s something for everyone. The Torch Theatre offers a mixture of events and entertainment suitable for the whole family to enjoy. Throughout the year the Torch Theatre stages local and touring dramas and cinema screenings of recent blockbuster films. South Pembrokeshire Golf Club has a wonderful 18 hole course which presents a tough, but fair challenge to golfers of all abilities all year around. Its setting on the Barrack Hill in Pembroke Dock, offers some superb panoramic views of the Cleddau Waterway, Preseli Hills, and surrounding area. It welcomes visitors and member's guests. Pembroke Dock's Flying Boat Centre is unique to the UK. Learn about the RAF Pembroke Dock, the worlds largest flying boat station and the famous Sunderland and Battle of the Atlantic. If you are interested in Fishing and Foraging during your stay in Pembrokeshire, look no further than Fishing and Foraging Wales. Fishing - The goal here is to put you onto some of the best Bass Lure Angling off the shore of Pembrokeshire, Wales. Matt Powell is a fully qualified and insured fishing guide under the Wild Fishing Wales scheme set our by Natural Resources Wales. Perhaps you're a keen angler who is just looking for a little advice and a simple day out fishing? To learn all about the way these fish hunt, where they hunt, what lures to use and when to use them, Fishing and Foraging Wales is the place to go. You can also learn about watercraft and bait-fish behaviour as well as gaining some professional tackle advice. Catch and release is practised for all the bass caught. Transport and equipment can be supplied if necessary, dogs are not permitted. Prices range from £95 to £550 with multiple day options available. Foraging - Learning foraging skills brings you closer to your surroundings and closer to understanding the fragile Eco-systems that are all around us. Together with Matt, you will gather in a sustainable way and in harmony with this precious environment. Matt will then create dishes with what you have picked, pairing it with local food goods for you to enjoy after the foraging. Parties of up to six are welcomed to enjoy this wonderful foraging and dining experience; larger parties need further notice. Booking forty-eight hours in advance is essential for prior food preparations. This is a dog friendly activity. Baskets and mushroom knives are provided. Prices range from £100 to £460. A dramatic geological feature, The Green Bridge of Wales is an arch naturally created in the rock as it wore away by the ebbing and flowing of the tide. Currently standing as an arch, it is expected that the top of the arch will eventually wear away leaving a stack of rocks in place. The Green Bridge of Wales can only be accessed through the Castlemartin Firing Range, so please call the Visitor Centre if travelling specially to check if the range is open. If you are making the trip, the chapel in the cliff, St Govans is nearby and is also well recommended. Built in 1093 with timber, before being rebuilt in 1189 with a stone structure, this castle is ovular in shape and surrounded by a mill pond. This castle has a gated house with a circulated keep, and has been extensively restored. Please Note: Dogs must be kept on leads. Pembroke Farmers Market is held from 10am to 2pm on Saturdays at Pembroke Town Hall. There is a wide variety of produce on offer - fruit, vegetables, plants and flowers, crafts, home-made cakes, pies, jams, local honey and free range eggs. 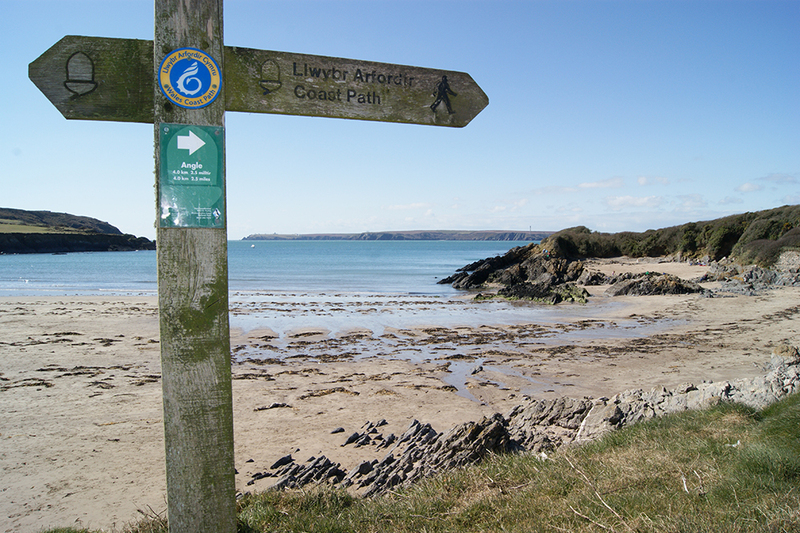 West Angle bay is a picturesque, sandy beach which overlooks Thorn Island, and is met by The Pembrokeshire Coastal Path from both sides. Angle offers the enthusiastic tourist a never ending list of activities, from walking The Coast Path, to swimming in the sea and exploring the hidden castles! Freshwater West is a huge sandy beach backed by sand dunes and has a rocky reef at the southern end of the beach. It is a haven for surfers, who are drawn to the area by the big Atlantic rollers, so it seems only natural that the beach should be the setting for the Welsh National Surfing Championships. The water here is in pristine condition and home to many species of bird life, seals and fish. However please note, it can be dangerous to swimmers because of strong undertows and hazardous quicksands, so families with young children should be on their guard. In the main season there are lifeguards patrolling the beach. There is a large car park above the beach with W/C. Look out for Cafe mor parked here too- an award winning food outlet with a menu focused around local seafood dishes. Cafe Mor is available from Easter until the end of the summer season. Freshwater West has featured in two huge films over the not so distant past - Ridley Scott's Robin Hood and also Harry Potter and the Deathly Hallows, where it was used as the back drop for Dobby's Shell Cottage. 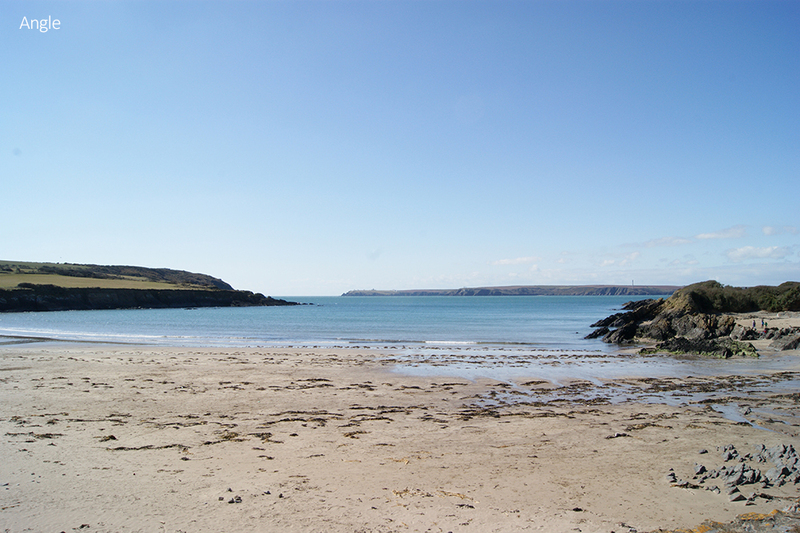 This lovely Pembrokeshire beach is also dog friendly all year around. Lindsway Bay is a sandy cove situated less than 1 mile from St Ishmaels. It is a lovely bathing spot for families, along with being popular with surfers. The nearest parking is in St Ishmaels village by the sports field. From here take the footpath along the west side of the field to the coast path, follow the coast path for approx 200 yards eastwards. Access to the beach is then down a steep zig-zag path with stone and concrete steps. At the bottom it is a short walk over the sandstone boulders to reach the sand. Once you get to the sand, you'll know it was worth the little stroll! A large expanse of subtly coloured sand is revealed at this estuary when the tide retreats. Suitable for bathing, although swift currents do arise at some stages of the tide. There are many rock pools for youngsters to explore as well as the stream and stepping stones on the western side - care needed when tide is coming in. There is a free car park on the grass which is adjacent to the footpath. This lovely and secluded beach is also open to dogs all year around. Watwick Bay is a beautiful, secluded beach accessible only from the Coastal Path, approx. 1 mile South of Dale village, or half a mile walk from the roadside - care is needed as it is quite a steep walk down to the beach. There are some great rock pools to explore and also a few caves. It is a sheltered sun trap in the Summer and a popular spot for passing boats. The sheltered bay of Dale is perfect for watersports - home to sailing, windsurfing and a watersports centre. Dale has a mostly shingle beach with some sand at low tide and an attractive seafront. Car parking is plentiful in the purpose built car park just across the road from the beach. West Dale is a stunning, secluded cove enclosed by towering cliffs and accessed only via steps from the Coastal Path - either by footpath through Dale or by parking on the roadside (very limited). At low tide, this tranquil little spot of sand makes the perfect spot for a bit of sunbathing and relaxing. This is where King Henry VII, born at Pembroke Castle, landed his army on the way to the battle of Bosworth. West Dale is very popular with surfers, at its best between low and mid tide - although its not for the inexperienced surfer and make sure you know where the rocks are! West Dale beach is open to dogs all year around! Marloes Sands is a beautiful, isolated stretch of sand with rocky outcrops that are perfect for scrambling over. It is rarely busy and out of season you are likely to have it all to yourself! From the beach there are good views out to Skokholm and Gateholm Islands, the latter of which is at the North-West end of the beach and can be reached on foot at low tide. The remains of medieval settlements can be found on the island. Surfing at Marloes Sands is usually excellent, but remember, there is a 1km walk to the beach from the car park. Note: Keep an eye on the rising tide as it can cover the whole beach fairly quickly. 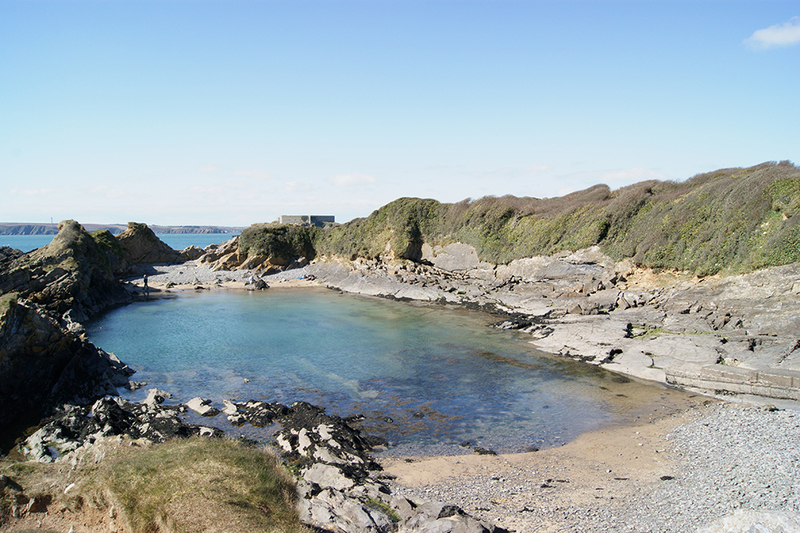 St Brides Haven is a shingle cove with sand exposed at low tide. It is excellent for swimming, bathing, snorkelling and diving. There are plenty of rock pools to explore making it great fun for families. Little Haven is a picturesque old fishing village with steep streets that descend to a sandy beach with a slipway for small boats, including the local inshore rescue boat. The beach itself is popular with swimmers, divers and kayaks in the summer months. At low tide you can walk along the beach to Broad Haven, passing Settlands on the way, there are numerous caves and rock pools to explore however Settlands is only accessible at low tide so be careful not to get cut off here. The Hibernia Inn is a seaside pub with a friendly atmosphere and is ideal for families. 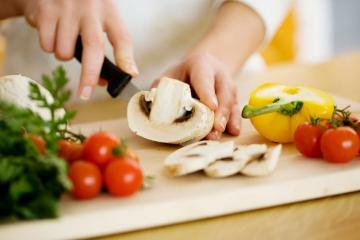 It has excellent choice of varied menus, children's menus, vegetarian meals and house specialities. Please Note: Dogs are welcome in the bar area and outside beer garden only. Wavercrest is situated overlooking west angle bay. Popular dishes include their locally caught crab salad and the smoked mackerel pate. A lovely little cafe serving good food with a nice seaside ambience. Please Note: Booking advisable during the bust season. The Old Point House in Angle is situated alongside the water at Angle Bay. It is a friendly pub popular with locals and holiday-makers alike, with quality pub classic meals such as sandwiches, fish and chips, sausage chips and beans, and chilli con carne. There are a range of ales and beers available, and there is outside eating areas perfect for a light lunch on a summers day. Alternatively, pop in on a winters day for a warm meal by their real log fire! Please Note: Dogs allowed in certain areas of the pub. Newly opened down Milford Haven Marina - The Lounge serves a variety of delicious food such as waffles, pancakes, breakfasts and a selection of savoury food such as sandwiches and scrumptious pizza. Replacing the location of what was previously Charlies Bar, Milford Haven Marina welcomes a brand new trendy Restaurant - COCOS. The Restaurant features the coolest interiors used by up cycling materials creating a vintage chic retro vibe but also keeping in touch with Milford Havens Industrial history. Cocos features a relaxing and welcoming atmosphere with a great variety of fresh foods ranging from fish and lamb to burgers and ciabattas. Cocos is open seven days a week with an evening meal menu available Friday-Saturday 5-9pm and an additional roast dinner on Sundays. Martha's Vineyard is a family-run restaurant based in Milford Marina. They have a bar and restaurant that serves good quality homemade food which is locally sourced food where possible. Food is served 7 days a week with lunchtime, evenings and Sunday dinner menus available as well as cream tea's with a large selection of homemade cakes. There is great views from the restaurant overlooking port of Milford Haven and they have regular live performances from local jazz and folk musicians. Dogs are welcome and they also have two outside seating areas including a dedicated smoking area. The Lord Nelson Hotel is situated in the heart of Milford Haven overlooking the busy harbour which houses a number of shops and a popular bowling alley and children's play area. It has a open plan dining/bar area, offering a vast menu which is a combination of classic Welsh dishes and traditional pub food. They serve a traditional roast on Sunday's alongside their main menu. They boast a large beer garden with seating and sunshade making it a fantastic place to enjoy a drink in the sun overlooking the water. Inside they have a pool table, dart board and plasma television screens in the bar with a huge pull down screen for those all important matches! The Harbourmaster restaurant has breathtaking views of Milford Haven Marina and estuary, perfect on a nice day for a bite to eat or a relaxing drink either inside or outside on the veranda. With a variety of homemade dishes on their menu and an extensive wine and cocktail menu the Harbourmaster is perfect for any occasion. Please Note: Guide Dogs only allowed. Lift access to the restaurant. The date for this event is not confirmed, but is set to take place some time late April. The Friends of the Pembrokeshire Coast National Park (FPCNP) will be paying a visit to Milford Museum which will be followed by a tour around Milford, and welcome you to come along. To book a place, please call our Concierge Team on 01437 772758. After it's huge success in previous years, the Haverfoodfest is back! Making the most of quality local produce, the Haverfoodfest welcomes everyone to sample the incredible food and drink that our local producers have to offer. With a number of food stalls, as well as demonstrations, competitions and entertainment, the Haverfoodfest is certainly one to be on the list of events to go to this year! The date for this event is not yet confirmed but is set to take place some time early May. Hosted by the RSPB and Marine Special Areas of Conservation, you can join the Friends of the Pembrokeshire Coast National Park (FPCNP) on a trip to the islands of Ramsey and Grassholm, both known for their magnificent wildlife and seabirds. This is a fantastic opportunity to go wildlife spotting and enjoy a Guided Walk learning all about the islands. Plan a visit to Picton Castle this May for their very first food festival - The Picton Feast! Spread across two days, this event will take place in the stunning grounds of Picton Castle. There will be a range of food and refreshments available with stallholders offering great produce, demonstrations, talks and music entertainment. This Charity Horse and Dog Show is an annual event which occurs in May each year in St. David's. With show jumping, dog shows, stalls and refreshments, this is a great day out for all those interested in horses and dogs! Running from the event headquarters at Crug Glas Country House Hotel near St Davids, this event sees approximately 1500 cyclists take part in the sportive tour of Pembrokeshire. There are now four distance routes covering much of North Pembrokeshire taking you through Fishguard, Newport and Cardigan depending on the distance you take part in. It's a great event for athletes and supporters alike, children can even take part too! Please note, all riders under 17 must be accompanied by an adult. Head to the peaceful village of Lawrenny this May for a festival dedicated to wellbeing of the mind, body and soul. Take part in a yoga or pilates class, zumba, ballet fusion or meditation. Learn something new in a chocolate workshop, a creative art workshop or even a spoon carving workshop! You will also have the opportunity to get involved with a range of activities including foraging and surfing. Top off your relaxing weekend with some great live music! See https://www.thebigretreatwales.co.uk/ for more information and to buy tickets. Please note, dogs are not permitted at this event. The St Davids Cathedral Festival takes place across ten days with a range of classical and contemporary musical performances taking place in the beautiful setting of St Davids Cathedral. This event is a success year after year, and is definitely one not to be missed. Performers in the past have included the BBC National Orchestra of Wales, The Sixteen, Goodwick Brass Band. Haverfordwest Male Voice Choir and the Cambrian Consort of Viols. Performance times vary, please see www.stdavidscathedralfestival.co.uk for more information - tickets can be bought online. Join the Friends of the Pembrokeshire Coast National Park for a walk along the beautiful coast at St Brides this Bank Holiday. Your walk will be paired with a demonstration at the Pumphouse in St Brides guaranteeing an interesting day out for all. To book a place, call our Concierge Team on 01437 772758. Please note, date may vary nearer the time. Spend your June Sunday exploring Manorbier Castle and the nearby coastline with the Friends of the Pembrokeshire Coast National Park. To book your place, please contact our Concierge Team on 01437 772758. This popular event is now a biennial event and shall return to our shores in 2019 - keep an eye out on www.pembrokeshirefishweek.co.uk for updates.This festival celebrates the very best of quality seafood caught locally as well as other local produce, and the local producers and businesses involved in the food and fishing industries within Pembrokeshire. Events happen all across the county the whole week long. Enjoy cookery demonstrations, boat trips, Take part in fish filleting workshops, seaside foraging, coastal walks, beach fun days and fishing adventures! The triathlon with a difference is back once again! Spread across the three days, the Wales Swim takes place on the Friday night on Tenby North Beach, the Sportive on the Saturday and the Marathon on the Sunday. Athletes can opt for just one event or all three meaning everyone who wants to can get involved! Children can even get involved on the Friday in the Taff Kids event! It really is a great event with an exciting atmosphere, athletes and supporters are encouraged to get involved for the whole weekend! The date for this event is not yet confirmed but is due to take place early July. The Friends of the Pembrokeshire Coast National Park (FPCNP) will be paying a visit to The Bug Farm near St Davids. This is a unique attraction run by Dr Sarah Beynon and you might even be able to pop in and sample some bugs at the Grub Kitchen onsite. To book your place, please call our Concierge Team on 01437 772758. This July, Friends of the Pembrokeshire Coast National Park shall be heading to the hills of Pembrokeshire with a walk at Narberth Mountain. To book your place, please call our Concierge Team on 01437 772758. Head to Llanddewi Velfrey with Friends of the Pembrokeshire Coast National Park (FPCNP) for a wonderful day out exploring the Welsh countryside. To book your place, please contact our Concierge Team on 01437 772758. Pembrokeshire's County Show returns for another year! This annual event brings thousands of people to the Haverfordwest Showground each year. With a variety of crafts and stalls, there is also displays, exhibitions and performances to see! There is a whole host of agricultural machinery on display as well as livestock to see, a fair, and a number of horse and dog shows. Of course there is also plenty of opportunities to meet and greet with local businesses, as well as sampling some great local produce on offer in the food hall! Milford Waterfront is hosting a Street Food Festival this August where you can sample tasters of delicious and mouth-watering dishes alongside refreshing drinks from a number of street food vendors. The date for this event is not yet confirmed but is due to take place late August. The Friends of the Pembrokeshire Coast National Park will be visiting the magnificent Picton Castle and Gardens. To book your place, please call our Concierge Team on 01437 772758. Accompany the Friends of the Pembrokeshire Coast National Park (FPCNP) this September for a walk along the coast of the St Davids peninsula between Porthclais and St Justinians where you will no doubt experience memorable views of the land, sea and wildlife. To book your place, please call our Concierge Team on 01437 772758. Saundersfoot's newest triathlon is back for 2019! Running the day before Ironman Wales, this triathlon is a sprint triathlon with a 750m sea swim, a 20km bike ride and a 5km run. The event is open to adults and children aged 14 and over. Ironman Wales returns to Tenby once again in 2019! This incredible event brings a whole number of athletes and supporters to the streets of Tenby and the surrounding Pembrokeshire villages for the weekend. The 2.4 mile swim kicks off the event first thing in the morning, before the 112 mile cycle takes place, before athletes complete the course with a 26 mile marathon. Whether you're an athlete or a supporter, the atmosphere in Tenby is like nothing else in the world - definitely a recommended event to attend! Tenby's much-loved Arts Festival returns to the seaside town for another year. With a host of music, drama and art, the Arts Festival is sure to have something to interest everyone. There will be a range of performances, talks and workshops for all to see. Once again, Narberth is welcoming visitors and locals to the village for their annual Food Festival. Make the most of the weekend and sample a whole range of quality local produce that Pembrokeshire has to offer. With entertainment, crafts and stalls, the Narberth Food Festival is a truly great festival and is recommended to all! Friends of the Pembrokeshire Coast National Park (FPCNP) will be hosting their AGM this October in Lawrenny. Walks and/or presentation details are to be announced nearer the time. To book your place, contact our Concierge Team on 01437 772758. The date for this event is not yet confirmed but is due to take place late October. Join Friends of the Pembrokeshire Coast National Park (FPCNP) for an evening of dinner and celebrations at their Annual Trafalgar Night Dinner which is taking place at The Mariners Hotel in Haverfordwest this year. To book your place, please call our Concierge Team on 01437 772758. The Tenby Blues Festival is back! Past festivals have drawn over 1500 people to the seaside town for this jam-packed blues festival, so it's no doubt this year's is going to be bigger and better than ever before! With performers and musicians playing at a range of establishments throughout the town, there really is plenty to see across the whole weekend! Get into the festive spirit at a Christmas Tea and Carol Service with Friends of the Pembrokeshire Coast National Park (FPCNP). Details are yet to be confirmed but this event is set to take place in early December. To book your place, please call our Concierge Team on 01437 772758. Tenby is known as one of the best places to welcome in the New Year. With an array of lively bars and pubs in close proximity and, of course, the famous midnight countdown in Tudor Square. Celebrate the New Year in at Saundersfoot with a fantastic free firework display on the harbour at midnight! A perfect way to bring in the new year, Victoria Hall in Roch is hosting their annual New Years celebrations with a bonfire and fireworks. The event starts from 5pm onwards with the lighting of the bonfire, and refreshments are available in the hall throughout the evening. Admission to be paid upon entry. A perfect way to start the year, whether you're taking part or just supporting! This event is all in the aid of charity with sponsorship coming from local businesses – everybody really does get involved! Each year they set a fancy dress theme to add to the excitement. A military fortress, museum and cafe located within the Pembrokeshire Coast National Park. The museum at Chapel Bay Fort is illustrated and explains military technology and weaponry through the ages, with a variety of displays including artillery and associated tools and instruments, WW I, Bomb Disposal and Waterloo amongst others. Volunteers are on hand to answer any question and add to your appreciation of the displays. Guided tours are conducted by a dedicated team of volunteers and provide access to areas of the fort which are otherwise out of bounds to the public. Tours present further information about Chapel Bay Fort and the defences of Milford Haven and the Royal Dockyard at Pembroke Dock, alongside information about the large exhibits displayed on the terreplein of the fort. A tour lasts approximately 40 minutes, and is included in the entrance fee to the museum. The Museum is housed in one of the oldest buildings in Milford Haven. The Museum collection reflects all of these aspects of the town's history, but focuses particularly on the maritime history. The Museum is a voluntarily run museum. Stackpole estate is a beautiful stretch of coastline owned by the National Trust, with sandy beaches, wooded valleys and lily ponds. Stackpole is a international nature reserve with a footpaths from Stackpole Court. Lots of wildlife habitat from otters, water birds and dragonflies and cliffs tiny coves and sandy dunes. From Stackpole you can reach Barafundle Bay which is a walk along the cliff path and down steep steps. Stackpole Quay itself also has a tiny harbour used by local fishermen and small pleasure boats. A must see for those who adore the Pembrokeshire Coastal Path, this is a tiny Chapel built into the side of a cliff overlooking the ebbing sea. To access this historical site, you must climb down a steep set of steps which is accompanied by a hand rail. Legend has it that you can't count the same number of steps down as you can back up - give it a go! Originally constructed in the 12th Century as a fortress made from timber, and has seen visits from a number of famous names including Oliver Cromwell and King Richard II. The castle was later reconstructed in stone, and was often used to house prisoners before being replaced by a new prison building inside the castle grounds in the 19th Century. This building is now home to the Pembrokeshire Records Office. Not much remains of the stone castle other than the stone wall which grandly looks upon the small town below it. A must-visit is the Town Museum, located in the Old Prison Governor's House. With artefacts, prints, paintings and models, this museum tells the history of the castle and the surrounding town. Once a retreat for medieval bishop's seeking a tranquil surrounding away from the Church, Lamphey Bishop's Palace has been extremely well preserved despite dating back centuries. The Western Hall, Inner Gatehouse and the 82 foot long Great Hall are still an impressive sight to see. Please note: Dogs must be kept on leads at all times. Pembrokeshire Motor Museum has over forty motor cars on display, from veteran cars to classic cars. For each car on display, you can see a complete history. All cars are in excellent condition and are occasionally used by their owners for vintage car rallies etc. so please bear in mind that cars may not always be on display. The Motor Museum is also home to a licensed bar, a magazine and video lounge where you can read and watch all about motoring. Carew Cheriton control tower museum, restored to original state as part of a community project. A lasting memorial to all who served on the airfield through two world wars. The airmen who main the supreme sacrifice during those years. A structure for educational use focused on school and group visits who are studying this period of modern day history. A tourist attraction offering a wartime experience. What a wonderful cottage in a great part of the country. Everything thought of and catered for. Thank you. We have had another wonderful stay. Sunshine every day was amazing – going back with sunburn! Our third visit and it just gets better and better. Planning our 4th visit soon …..
A fantastic week at “Silk Purse” cottage, and Angle village is just the best. We will be back …. Missing the crab at Wavecrest already. Thanks for a great week. Fabulous accommodation. Everything we could have possibly needed was here. We loved Silk Purse, the location, the weather, the feeling of freedom. It was nice to be met on arrival. 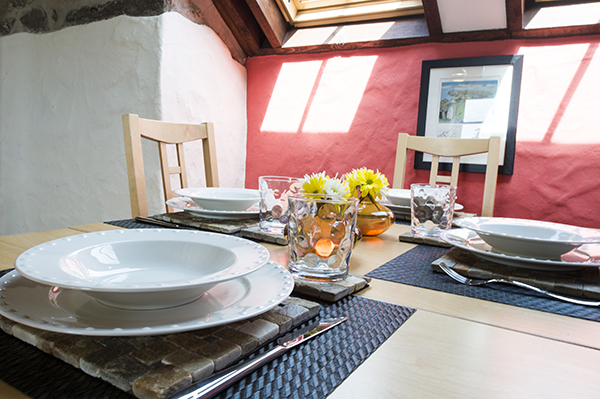 Silk Purse is a wonderful cottage – warm, friendly and comfortable. West Angle Bay is wonderful and the walks around are superb. Thanks, especially for the treats on arrival. A lovely property with everything you could possibly want. We had some lovely days out in Tenby and St. Davids and enjoyed the beach at West Angle Bay. Food at the Point House and The Hibernia was good, and the take-away service at The Hibernia was also very good. We had a lovely week here. We’ve had a lovely holiday at Silk Purse, a great location for exploring Pembrokeshire’s amazing beaches. Great cottage – very comfy with everything we needed. Our 2 year old especially appreciated the garden We’d love to come back! What a week! The cottage is glorious and the surrounding area just beautiful. Barafundle and Broadhaven beaches are completely unspoilt and perfect for sandcastles; and West Angle Bay is amazing for rock-pooling. The children enjoyed Folly Farm and the Blue Lagoon indoor water park. We all had a fabulous meal at the Stackpole Inn, as recommended by previous guests. Thank you for such a thoughtfully appointed cottage – even ice in the freezer for our welcome drinks. We are recommending Silk Purse to all our pals. What a lovely cottage. Great location. We enjoyed swimming, rock-pooling, crabbing, fishing and walking along the ridge at low tide. We also watched a young fox and bats from the cottage in the evening. The cottage is very well equipped which made our stay very easy. Thank you so much. We’d love to come back. Our third and even more enjoyable visit to Silk Purse. Thank you for all the fabulous welcome touches – especially the fruit bowl, devoured by the children! We had a “mixed bag” of weather, but still had great beach days at Broadhaven, Freshwater West and of course West Angle. We hope to be back soon for our 4th visit. Diolch am bopeth. A great holiday house. We’ve had a lovely time on the local beaches. Thank you for all the lovely treats. Our first visit to Silk Purse was home from home. First class attention to detail; everywhere was spotless and ship shape. Beautiful views from the bedrooms and living room on fine evenings. We had a fantastic week and Silk Purse really topped it off. Thank you. Here we are again after 4 years and it still feels like home! One week is never long enough, but it has been wonderful from the start. We have been to the beach 3 times and have loved body-boarding in Freshwater West. Just perfect again. We would love to come back. Our 4th visit to Pembrokeshire and we’ve had a great week in this lovely cottage. Visited the various beaches but particularly enjoyed walking the Marloes and Dale peninsulas and running the Angle peninsula walk. Food at Stackpole Inn and Wavecrest really good. Be back to this part of the world soon. Brilliant week in a fantastic cottage. We just love Silk Purse. Weather has been great. Plenty of walking routes – the dog loved them all. Lovely food at Wavecrest, and Stackpole Inn is something special. Enjoyed eating Sunday take away lunch out on the patio in the sunshine. A holiday to remember … and we will be back. Fantastic week in a beautiful cottage; and wonderful walks along the Coastal Path. Highlights were: West Angle Bay to Freshwater West; Stackpole, Barafundle, Broadhaven, Manorbier and Freshwater East; a windy walk at Marloes and managed to spot at least 30 seals and pups. Also enjoyed visiting Tenby with many good places to eat. Once again, Wales hasn’t disappointed us. We will return. Wonderful week in this lovely warm and cosy cottage. Lots of walking on the coastal paths and on the beaches. Thank you once again for all the touches that make us feel we are staying in someone’s comfortable home rather than just a rental cottage. We will return. Once again we have had the best time here in Angle. Silk Purse is such a lovely place to stay and it really feels like home to us all. Wonderful festive touches. We are looking forward to our next visit. A great week – one to remember. Great area for walking, exploring and finding foxes. Had a fantastic meal at the Stackpole Inn. Now feel ready for the year to come. Thank you for the welcome treats. What a wonderful time – complete relaxation from start to finish. We enjoyed our first coastal path walks and ended up in the Hibernia Inn watching rugby, meeting friendly locals and enjoying an ale (or two). The walk down to Broadhaven was lovely and we had a delicious Sunday roast at the Stackpole Inn. However, one of our favourite highlights was just enjoying a lazy Sunday afternoon in the cottage – just loved all the cosy blankets and the relaxed feel of the cottage. All the lovely touches made it feel just like home. It is obvious that a great deal of effort has gone into the design of this restful holiday home which contains absolutely everything you could wish for. We have appreciated the treats, attention to detail, comfy beds and high standards. Four out of seven days of sun were an added bonus, and although the surf disappointed this year, the coastal walks completely made up for it. Lovely welcome and a superb week – again! Lots of lovely walks and sunny days, and The Old Point House was an added extra. A shame the shop has closed. A lovely relaxed week – great to be here again, away from the hustle and bustle of work. Hope to return next year. Another wonderful week! Thank you for the warm welcome and for this beautiful cottage. Lots of great days on the beach and revisiting old favourites like St. Davids, The Sloop at Porthgain and the Druidstone Inn. Also some new favourites such as Bosherston, Stackpole and Pembroke Castle. Didn’t manage to see/do all we wanted to, so we will just have to come again. See you soon!! Beautiful accommodation and a lovely welcome. The countryside is awe-inspiring. Altogether a wonderful holiday in a very happy home. Thank you from all of us. Another happy holiday in Silk Purse, not least because of the hard work and generosity of its lovely owner. Angle and the rest of Pembrokeshire is where we were born and grew up. As returning exiles we wonder why we ever left! When we read the comments in this book we are so pleased and proud that others love it too. Lovely welcome and treats. Silk Purse is so comfortable. Had a great week with walks around Stackpole and Marloes – we can feel our knees! We are going home relaxed and a bit “brown”!! Wonderful accommodation in a great location. Silk Purse has everything you could wish for and great attention to detail. Great walks from West Angle Bay and a very good café with excellent food. Also enjoyed Freshwater West – lovely beach and a doggy heaven. Stackpole Quay is a must do walk and Carew Castle is an interesting visit. Great weather just topped the week off. A warm welcome and a beautifully decorated cottage with wifi much appreciated by our two teenagers. Despite contact with the outside world, had a relaxing week!! Enjoyed walks around the Angle peninsula with a stop off at the Old Point House. Best walk was Stackpole Head which was actually 6 miles. Barafundle beach was beautiful and Rocky the dog loved splashing in the waves. Doggy heaven was Freshwater West – enjoyed walking the length of the beach. Visited Tenby which was very busy, but enjoyed a Pembrokeshire Pasty. Thanks for a great week. A fantastic cottage and lovely walking area. The walk to Freshwater West and its amazing Butty Van was superb! The Old Point House and Hibernia Inn are good for food.and drink. A great holiday. We found Silk Purse welcoming, comfortable and well equipped – a new “favourite” to add to the list. The first 4 days were “scorchio” so enjoyed the delights of West Angle Bay. Also visited Milford Haven Museum and the Waterfront Gallery – both dog friendly. Possibly the best place we have ever stayed. Friendly welcome. “We liked everything in the house” (Lowri aged 3). Peaceful and perfect location. Great for running, walking, beach and base for exploring. Wonderful base for our two week holiday. Many lovely beaches to explore including West Angle where we went swimming on one of the hotter days. Lots of lovely walks along the coast and river esturies. Visited interesting local castles and excellent eateries. Weather was mixed. 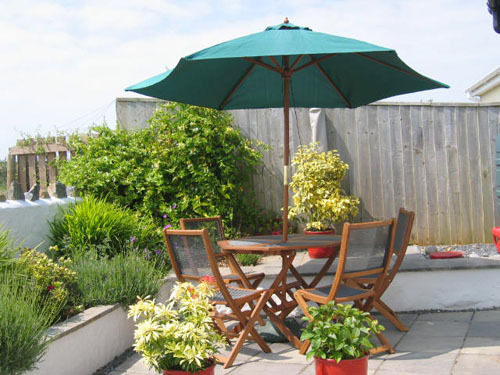 The whole Pembrokeshire area is lovely- we will return.. Cottage – lovely with all the comforts of home. We have been coming to Pembrokeshire for years and love it here, but “wow” this lovely cottage has made our visit extra special! You have beautiful taste and really have thought of all the little extras that make a family holiday easier and more enjoyable. We are taking back lots of lovely fun memories ( and will especially miss our herd of friendly cows over the back fence – we’ve even named our favourites!). It was lovely, thank you so much. We hope to return. A memorable holiday in a lovely cottage, although it is safe to say we didn’t need to water the tubs or garden plants this week. Lots of wonderful walks and beautiful beaches. Both pubs in the village were very welcoming and the food was good. Lunches at the Wavecrest café were a delight, as was the food at the Butty Van in Freshwater West. Pembroke Castle was really interesting and dog friendly. If you enjoy your holiday half as much as we have, you will have had a great time. It is no surprise that many people return to Silk Purse. Thank you for a lovely welcome back at Silk Purse. Our fourth visit here didn’t disappoint! We’ve had a fantastic week body-boarding at Broadhaven and Freshwater West – two of the best views anywhere! The food at the Old Point House was great and the children enjoyed crabbing off the jetty. Wavecrest was great and the fish and chips at the Hibernia were amazing. Thank you for making everyone so welcome. What a wonderful haven of comfort and tranquillity you have created here in Angle. Your welcoming hamper was most generous and even included treats for the 4 legged member of the family! While we have been blown around the area in the windy weather, we have also been lucky enough to enjoy the sunshine while admiring the stunning scenery from the many coastal paths we have followed. Highlight of the week was the Stackpole Estate plus lunch at the Wavecrest Café – yummy! Thank you. You have thought of everything and we are taking home many happy memories. We arrived in Storm Brian and had a mixed week of weather. The cottage is cosy and well equipped. We loved Angle – so quiet and peaceful. We walked miles along the coastal path and spent a day cycling from Pembroke via the Cleddau Bridge, on to the Brunel Trail at Neyland and on to Haverfordwest. Thanks for the treats – much appreciated. A return visit and cottage still as lovely as ever. Cottage and location were everything we could wish for. Had a wonderful time here over Christmas. Thank you for all the little extras. We shall look forward to returning. 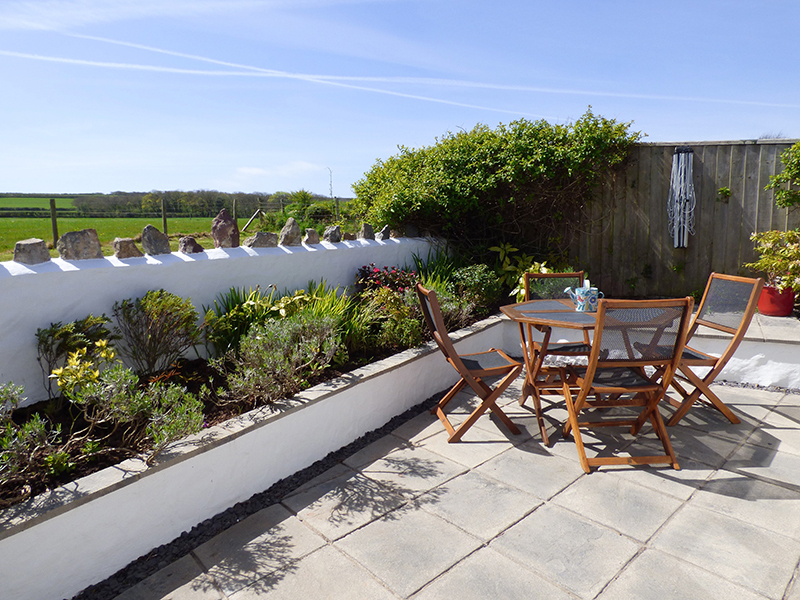 A beautiful and well-equipped country cottage for a great outdoorsy holiday by the sea. We enjoyed the recommended local walks, a great boat trip from St David’s to see the seals, and beach riding from Nolton Stables. The lobster rolls at Café Mor, Freshwater West, were amazing, as were the rock pools there and at West Angle Bay. Thank you so much for the lovely welcome treats and for having thought of everything – the information leaflets and walking maps were brilliant. We have spent a very happy week in this lovely cottage. We’ve done lots of walking, the weather has been good to us, and we enjoyed the basket of treats. We really enjoyed our holiday in this lovely cottage. Although the weather has been mixed, we have visited some lovely places and beaches. We will definitely be back again. Thanks for the very enjoyable welcome pack. We had a lovely warm welcome at this beautiful cottage, where there is so much attention to detail. Great sunbathing weather, and lots of walks and wonderful beach visits. We can recommend the Military Museum (awesome!) and the Café Mor food van at Freshwater West. The take-away food from the local pub was very good, and we enjoyed a fantastic on board tour of Angle’s lifeboat station and a tour of the old church. Thank you for a wonderful stay at your lovely cottage. It really felt like home. There was so much to visit in the area – Pembroke Castle, St. Govan’s Chapel, Broadhaven South beach, and of course St David’s and Solva. We made the suggested detour to “Something’s Cooking” in Letterston for great fish and chips! Barafundle Bay and Bosheston Lily Ponds provided lovely walks, but our favourite has been Freshwater West which we visited most days, and West Angle Bay for watching the sunset. We are going to miss having the beach just down the road, and the garden – and the local cows! We hope to be back. We have been coming to this part of Wales for the past 10 years, and must say that this is the best cottage we have stayed in. It is lovely, so clean, and the treats/welcome was wonderful. Weather has been great – sunny every day, although the rest of England has seen snow! Managed to wear T-shirts and shorts! Very nice people in the village too. Molly the dog is 13 years old and has had a lovely time here as the location offers so much. Coming back this June! Wow!!! 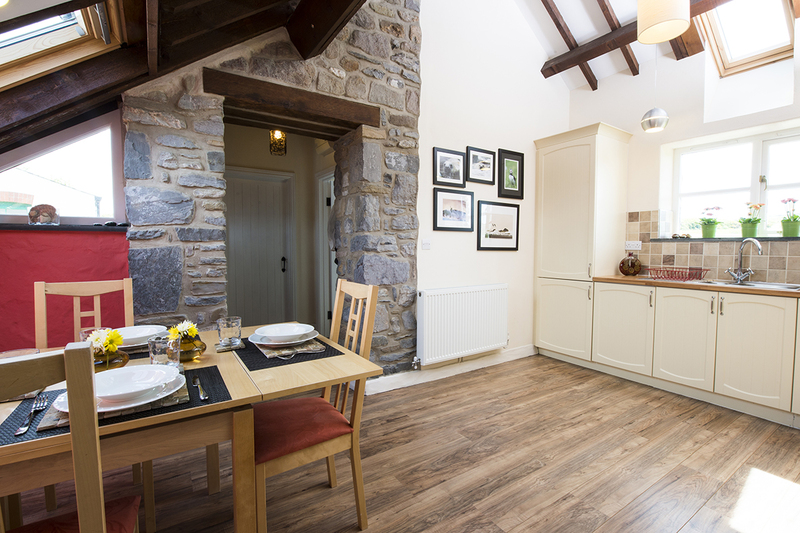 Amazing cottage – homely yet functional for us as walkers; super “treats”. Weather was kind to us – suntans in April!!! We will definitely return. Thank you. Lovely cottage, lovely views. We were lucky with the weather and visited Tenby, Freshwater West, West Angle Bay, and also drove to St. Davids and took a boat out to Ramsey Island – well worth it. Thank you for the lovely extra treats. We will recommend this cottage. To say that we don’t want to go home would be an understatement! A lovely cottage, full of thoughtful touches wherever you look. Stackpole Inn is well worth a visit; and we enjoyed walks at Freshwater West, from Bosherston to the coast, and also went up to St. David’s by car via Newgale (aptly named!). Thank you for creating a perfect get-away retreat. The cottage is great - so cosy and well-equipped. We loved the area and the lovely welcome we received. The extra touches are very thoughtful. Highly recommended! 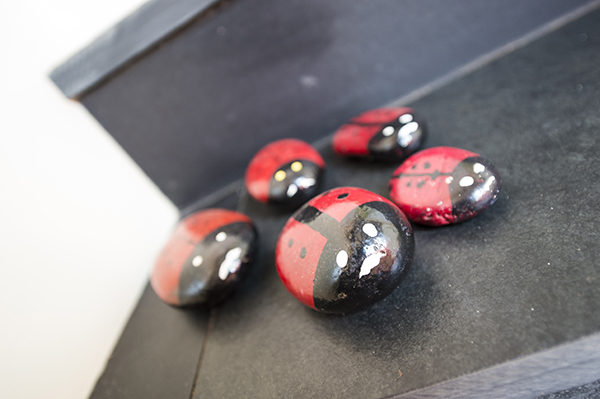 A lovely cosy cottage with beautiful decorations – we loved the ladybirds! Thank you for a beautiful stay and for the Welsh cakes and sweets. We loved the walks around Angle and discovered Chapel Bay Fort with its museum and beautiful tearoom. Freshwater West and Broadhaven South were lovely but stormy; the lakes were as lovely as ever; and Stackpole Mencap Gardens are well worth a visit. St. Govan’s Inn serves beautiful, tasty food. Yet another wonderful stay at Silk Purse. The extra touches, as always, are greatly appreciated. For the time of year we had really mild weather which meant we were able to get out and about. Watching the filming at Broadhaven South was exciting; and the takeaway food at the Angle village shop was fab, especially the curry and the excellent fish and chips. Well recommended! Our second visit and as stunning as before. Thanks for another warm welcome. We walked part of the Coastal Path – what stunning views! – and we had a very enjoyable day fishing in the bay. We are planning our 3rd visit next year. A very cosy cottage. Thanks for the chocolates and the Welsh cakes. Recommend a day trip to Marloes Beach – great for rock-pooling; Freshwater West was good for body-boarding; and Anna’s Welsh Zoo is worth a visit. Weather could have been better. Wonderful to be back in Silk Purse and Angle. Thank you again for all the wonderful welcoming touches. The weather has been very kind (and even hot on 2 days) allowing us to visit Broadhaven, Freshwater West, and Angle at their stunning best. The children loved “body boarding” and Tess the dog had some amazing walks. We really recommend the “van” at Freshwater West – best burgers and bacon butties ever! We hope to be back next year! Silk Purse is fantastic – cosy and well presented. The special touches on our arrival were very much appreciated and enjoyed. We have loved our time in Wales and with the fab weather we have been to lots of beaches. Barafundle is a must see; Tenby was a pleasant surprise; and Wavecrest @ West Angle Bay has lovely food and service. Thanks again. Had a lovely week in Silk Purse in Angle. A real home from home. Weather was a bit up and down, but that didn’t stop us visiting the lovely beaches - Broadhaven, Manorbier, Barafundle, West Angle Bay, Freshwater West. Stackpole Inn was lovely for a quiet drink outside. Also enjoyed Tenby and Folly Farm. Thank you for all the care you give to ensuring we have a happy and comfortable holiday. Silk Purse and our “seaside landlady” are very special; and our home county never disappoints. We were very lucky with the weather and had a wonderful week. The marvellous accommodation added to a very relaxing week. Thank you for a warm welcome and all the extra delightful touches in the cottage. 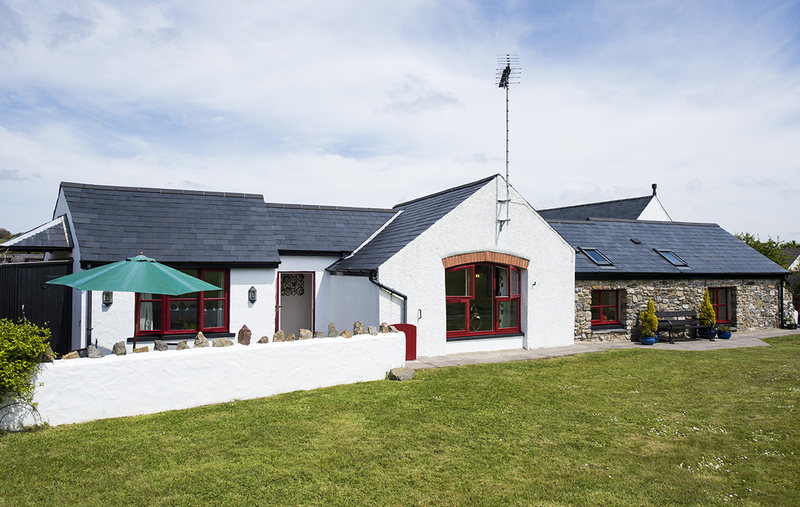 We enjoyed staying in this lovely cottage – comfortable, peaceful and very welcoming. Thank you for a great holiday. A return visit and just as lovely as ever. The treats were much appreciated; and the walks have been excellent. We particularly enjoyed the guided tour of Chapel Bay Fort, having first seen the semi-derelict state over 30 years ago! We shall be back again to such a comfortable cottage. Thank you for a fantastic week in this lovely cottage. We really felt at home and loved spending time on the beach and in the village. We loved the beach café and the Point Inn. 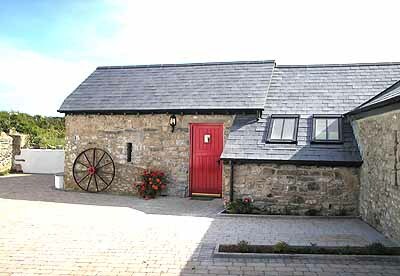 We have visited Pembrokeshire many times but have never stayed in such a beautiful cottage. We will definitely be back. What can I say that has not already been said. 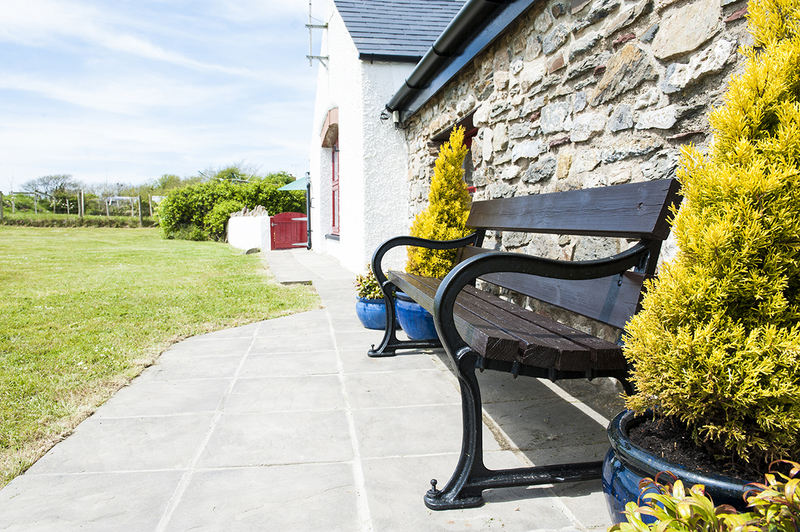 We’ve stayed in many cottages both in Angle and throughout Pembrokeshire, but can honestly say that Silk Purse comes top of the list for comfort and location. Every small detail has been thought out to make visits very enjoyable. So nice to meet old friends from the village and visit our favourite places, but what made this visit more special was to return to Silk Purse each evening. Despite the weather, gale force winds and heavy rain, the couple of days when the sun came out were absolutely splendid. We did manage to visit Freshwater West a couple of times, both on a windy and deserted day and late afternoon sunny, warm and deserted day – bliss! Thank you for this home from home, the little touches, the warm welcome after a long drive, the warm environment to watch the grass grow, and the sky. The perfect and safe garden for Bonnie to roam. The space to relax. I will miss our morning walks to the shop for the paper, and then on to the point, lifeboat, fort and beach on our walk back. We will be back. To those who follow – enjoy! We’ve had a relaxing time at Silk Purse. Beautifully renovated cottage and idyllic views. The kids loved playing with the friendly neighbourhood cat every morning and having lovely walks on Angle beach. Fun trips to Folly Farm, Tenby and Blue Lagoon. Thanks for a very special half term break. Two weeks in this fabulous cottage lie behind us; we enjoyed every single day! The weather was (nearly) perfect, the coast is magnificent. We did a lot of walks with our dog on the beaches and the coastal path. We were overwhelmed by the views. Stack Rocks and the Green Bridge of Wales are hidden treasures. A beautifully appointed cottage and a lovely welcome. Thank you. We have enjoyed our holiday very much and the weather was kind to us until Thursday. We have walked every day and visited many beautiful beaches. Here in Angle there is a lovely walk up over the headland and down past the Old Point House for a well-earned drink overlooking East Angle Bay. The highlight of our holiday was our impromptu visit to the Angle Lifeboat Station and meeting the very friendly and helpful resident crew, who invited us back to watch the practice launch. Everyone in Angle is so friendly, it has added to the overall enjoyment of our lovely holiday. The recipe for a relaxing holiday is:- -	good accommodation -	peace and quiet -	beautiful scenery and views Silk Purse has provided all the ingredients. Thank you for a wonderful gem of a holiday cottage. We have enjoyed a fantastic week on the beaches, surfing and making sand sculptures. Silk Purse is beautiful with all the home comforts we needed. We loved sitting and playing in the garden in the sunshine and its shelter from the sometimes “fresh” wind. We’ve thoroughly enjoyed our return to Pembrokeshire and hope to come again next year. Thank you sooo much once again for a fantastic week in this lovely part of Pembrokeshire. The weather has been amazing, so we’ve had a few swims in thesea and plenty of games on the beach. 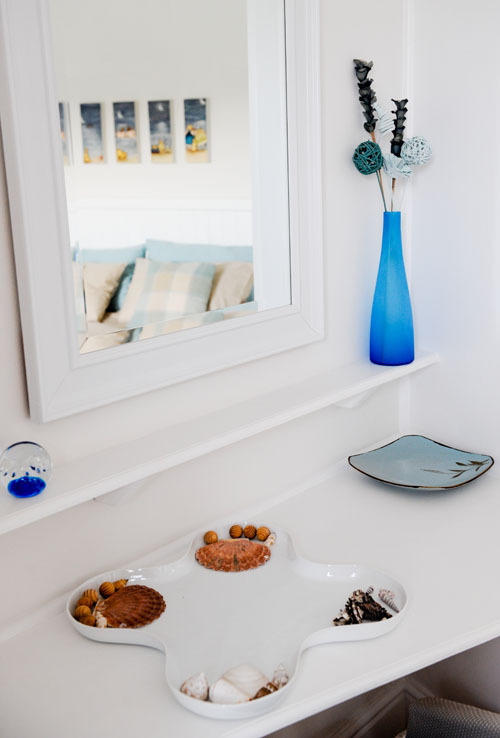 We love the special touches of welcome – they always make our first few days in the cottage very special. We love the “Wave Crest” in the bay. What a great addition to Angle. Roberts – September/October 2014 Amazing weather for the time of year – sunshine and very warm for the last two weeks. Silk Purse is as excellent as ever; and Wave Crest is a major addition to Angle. Already planning to be back in 2015. What a delightful cottage! A home away from home. Great place from which to see all that Pembrokeshire has to offer. WOW! This has been amazing! All the small touches make this a home from home. We loved the people – everyone is so friendly and helpful. The beach is fantastic and even though the weather was nor brilliant, we has an amazing stay. You will definitely see us again – we are planning to walk the coastal path. We don’t actually want to leave. This is our third visit to Silk Purse – we love it here. We have had another lovely week living in this wonderful cottage. It is always so clean and we get a very warm welcome. We used to bring our caravan to Angle for several years until age caught up with us. Yet another lovely week in this beautiful cottage and most welcoming village. We had all the usual walks and some new ones. Its great to have the village shop. We hope to come back again soon. What a delightful Cottage! A home away from home. Great base too see all that Pembrokeshire has to offer. Really enjoyed Manorbier and the walk at Broad Haven. Lovely, relaxing, peaceful holiday in a beautiful quiet setting. Perfect cottage well equipped and very comfortable. Stackpole estate well worth a visit Barafundle and Broadhaven beautiful beaches. Stackpole Inn, wonderful food but very popular so booking advised. Absolutely fantastic weather, we have had a great week! Thank you for the little touches much appreciated - Thanks again. We have relatives who live in the village and we come to Angle around twice a year! This is the best place we could have chosen to stay. Its beautiful with stunning views. Thank you for your hospitality. A beautifully appointed cottage and lovely welcome - Thank you. Linda, we have enjoyed our holiday very much indeed and the weather was kind to us until Thursday! We have walked everyday and in and around Stackpole being our favourite. Everyone here in Angle and the surrounding area, that we have met are so friendly, it has added to the overall enjoyment of our holiday! What a perfect week! It has been wonderful to be back in Pembrokeshire and Silk Purse again. Having missed a trip last year it's been lovely to have a whole week here this time. The weather has been amazing, the beaches (West Angle Bay, Freshwater West and Broad Haven) have been stunning as always and the sunsets beautiful. William celebrated his birthday here which was particularly special having been born in Pembrokeshire 5 years ago! It has been great catching up with old friends and places and I'm already planning next years trip! Linda, thank you so so much for everything that makes a stay here such a treat. Flowers, wine, chocolates, welsh cakes etc. William announced this morning that he would like to stay forever we too wish we could pick Silk Purse up and take it home! What a superbly appointed cottage with fantastic views and such a lovely welcome from Linda - She really does think of everything! We have has a fantastic week and go home refreshed but exhausted after all the amazing walks we've done! Would love to return soon! After staying here a few times before, where else could we possibly decide to spend our Honeymoon! Silk Purse - Fantastic! Weather - FANTASTIC (Yes in November) and Angle as fantastic as ever! Food and hospitality at the Hibernia was really good. New favourite area- Marloes Beach. Well worth the effort of finding. Thank you Linda for the special extra touches - we will return - Again! Wow … we have had the most amazing week! Such a relaxing family time together. Whatever the weather we have always found something to do – collecting stones and shells; we have even painted our own ladybirds and carved pumpkins for Hallowe’en. 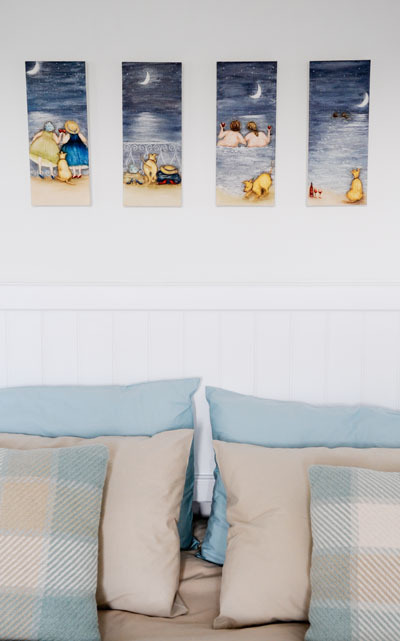 We’ve had wonderful days out – but best of all just chilling out in this cosy home. Thank you. .
We nearly didn’t make it back to Silk Purse this year, but our last minute trip has been a real treat once again. We’ve spent much time on the beaches, with much digging and treasure hunting by William. The views from the main window are as delightful as ever, and relaxing in Silk Purse at the end of the day is total bliss. As I said last year, and the year before – next year we must come for longer. Thank you, thank you, thank you! If you wish to switch off from the pressures of modern day living there can be few places as good as the Silk Purse. This has been our very pleasant experience during the last two weeks in this delightfully situated, well designed and fully equipped barn conversion. We are already planning to return. Our third visit has probably been our best so far. We have been able to slow down the clock and totally relax. We were made to feel most welcome. We only had 2 days rain in a fortnight – so Angle strikes again with its own weather! Thanks for a lovely stay. The cottage is absolutely lovely – wish we could pick it up and take it home! Thanks for the welcoming touches – the tea and Welsh cakes went down well after our long journey. We had lovely weather and took advantage of the sun-trap patio at every opportunity when Bailey wasn’t dragging us off to the beaches. Lovely relaxing week – just what we needed. Thank you so much for your lovely cottage. This is such a lovely cottage, we really don’t want to leave. Thank you for the personal touches and for creating such a cosy home. We have had beautiful weather all week, so we have visited all the beaches! We have really enjoyed our return visit here. Such a pleasure staying in this fantastic cottage. We have managed 3 swims in Freshwater West and a great BBQ and fire on the beach; some coastal walks in the wind and rain; breakfasts in the garden in the sun; and of course the picking of juicy, ripe blackberries to make a delicious crumble! Thank you for all the little touches . We are very familiar with Pembrokeshire and always find something new to do. Silk Purse is the icing on the Welsh cake!! Just a fabulous cottage – it has made this stay even more memorable. Delightful cottage to come home to after a day out exploring! Well you certainly didn’t make a pig’s ear out of this cottage! We were delighted when we arrived and felt perfectly at home throughout our entire stay. The views are gorgeous and the little touches all make abig difference. The décor and furnishings are lovely and work so well woth the cottage. We’ve had a great stay. Thanks very much! This cottage is definitely Olympic Gold standard! We have enjoyed staying here, going out on trips and watching the Olympics. Many thanks. The best holiday cottage that we have stayed in. A warm welcome and everything to hand that we needed. Thank you for sharing this wonderful home. We are surprised but glad you haven’t kept it to yourselves!! We’ve had a great week and shall definitely be coming back. Wonderful walks, lots of nice pubs and superb surroundings. We are quite depressed to be going home. Have enjoyed another wonderful holiday in a beautifully arranged cottage. Silk Purse has everything you could wish for. Hope to be back soon. Our third visit to Silk Purse and as ever we have enjoyed our stay here. Wonderful …. We knew we were in for a lovely holiday when we stepped into the living room and saw the view. Many thanks for such a friendly and attentive welcome. We have stayed in many properties and this is a gem. 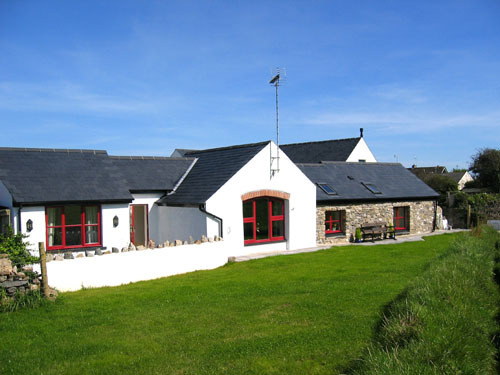 Wow – what a lovely holiday location for a week in Pembrokeshire! Silk Purse is a beautiful and charming cottage, so well equipped – a real home from home. It has been an absolute pleasure to stay at Silk Purse. Thank you. A very relaxing enjoyable week. Weather has been very kind for the time of year. The cottage is lovely –worth 5 Star. Welcome gifts a great touch. This has been just what we hoped for – a break in a beautiful clean, comfortable cottage, with lovely cliff and beach walks nearby, plus castles. Lovely to return to Silk Purse again this year – and once again we wish we could have stayed longer. Maybe next year! Best cottage we’ve ever stayed in – and we’ve stayed in lots! Best weather we’ve ever had in September – it’s official. Totally worn out our Westie, Lucy. Thank you so much for providing such a beautiful relaxing cottage with so many thoughtful extras that have been greatly enjoyed. You may not make a silk purse out of a sow’s ear, but you have certainly made one out of a sow’s home! We have had a marvellous time being by the sea again – exploring, pottering around, surfing etc. Everything being animal- friendly is excellent too. Zocco had a great time. This is a fabulous cottage – the best ever. We couldn’t have had a better base for comfort and relaxation. Definitely 5 Star. Had a great week relaxing in such a lovely cottage and beautiful part of Wales. It’s great how the cottage is set up to welcome you with everything you need – right down to the bottle of milk. Altai (the dog) loved going out and about on the beaches and around the headland. Lovely family holiday, and we definitely plan to return. Lovely cottage in a great part of Wales. We loved the patio, the garden and the cows! The cottage has been just what we wanted and more. We appreciated the supply of things like foil and dishwasher tablets (and the Welsh cakes! ), so thank you for making this week so easy. Great weather and a fantastic cottage. Everything we needed was here, including the cows! We went to Freshwater West five times in one week – plenty of boarding and silly games on the beach. Great coastal walks, even in the sun. A fantastic holiday – the boys loved Freshwater West with their body boards etc. The cottage has provided luxury at the end of each day. The cottage provided the relaxation we are looking for, and it’s nice not to have the noise of passing traffic. We were able to fit in all our activities, including breakfast and afternoon teas on the terrace! Superb cottage, well-equipped and beautifully decorated. I could live here. We’ve had a fantastic stay in Angle. The weather has been great and we even saw a dolphin in the bay at Barafundle. We’ve previously stayed in a number of National Trust cottages, but Silk Purse beats them all – lovely décor, great views, comfy sofas and beds, everything we needed. Well, what can I say – yet another wonderful holiday in beautiful “Silk Purse”. We have spent hours down at Angle Bay, where the children loved playing in the sea, rock-pooling and building sandcastles. We will definitely be back. We have had a fantastic holiday in this wonderful, very well-equipped cottage. We have had great weather and have enjoyed many walks in the area, especially the Coastal Path. After a walk in the hot sunshine it is good to chill out on the patio and watch the cows. We could not have asked for a more comfortable or luxurious cottage, and we hope to return. As everyone before us has said – what a wonderful, comfortable, well-equipped and welcoming place “Silk Purse” is, from the Welsh cakes and much-longed-for cup of tea on arrival, to the luxurious bedding and towels. The attention to detail is first class. We have been unlucky at times with the weather, but have enjoyed staying “at home”! Thank you, thank you, thank you. I would just like to add that we have rented various properties over the years, but “Silk Purse” is the highest standard by far. What a wonderful surprise to find this lovely spot, only outdone by the cottage. “Silk Purse” is outstanding – extremely comfortable and easy to live in. A real home from home. We have thoroughly enjoyed ourselves and have seen lots of gorgeous places. We have some lovely memories and “snaps” to take back to Australia with us. We have had plenty of sunshine and some great walks around here. Angle is a lovely village and we couldn’t ask for a more comfortable place to stay than Silk Purse. There is nothing more we can add to all the complimentary comments relating to “Silk Purse”. Amazing week in an amazing cottage!! Beautifully done out and well worth the 5 stars. We have enjoyed the gorgeous walks and beaches along the coast; and we also love the small quirky towns. Hope to come back in the future. Lovely relaxing week. The property is well-equipped and extremely comfortable. We have walked our socks off and are going home for a rest! Thoroughly enjoyed our stay in this lovely renovated property – one of the best cottages we’ve stayed in in the UK. Great weather for March and some fantastic beach walks. Had a wonderful week, enjoying the beautiful cottage and surrounding area. Crocuses and daffodils came out especially for us! A fantastic and inspirational cottage. 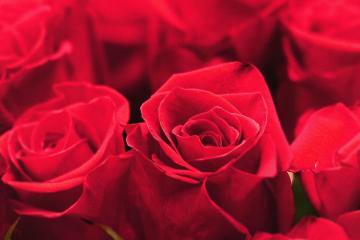 A big thank you for a special Valentine break. Outstanding. The old “pig pen” was a real treat. See you again soon. Angle and the surrounding area has always been absolutely fantastic; and Silk Purse has been a remarkable base-camp. It is such a treat to come and stay here. “Silk Purse” really is the perfect place to stay, with all the comforts and extra touches which make it so special. I didn’t think it was possible to relax with an 18 month toddler in tow, but within a short time we felt chilled and truly on holiday. We’ll definitely be back. PS. Thanks for arranging such a beautiful sunset on Monday evening! You have indeed proved that you can “make a silk purse from a sow’s ear”. It has been such a pleasure to enjoy this lovely cottage and its environment. It has been a joy to return to this home-from-home after visiting places in Pembrokeshire. This has been our best holiday home ever. Very enjoyable stay. Cottage extremely comfortable. I think you’ve thought of everything. Love the secluded garden – a real home from home. We’ll take home happy memories of Angle and Silk Purse. Excellent stay. Cottage much larger than expected from illustrations. Weather brilliant – although a little windy for sailing. Good walks, as ever. Saw seals and pups. 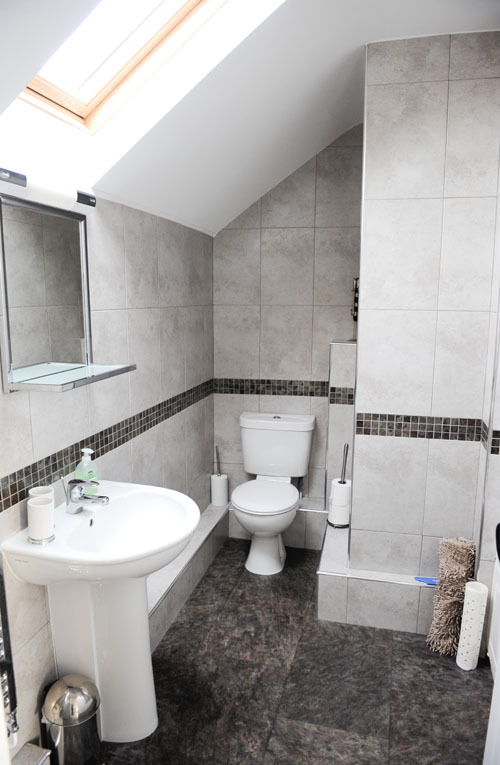 Great facilities in this very comfortable cottage. 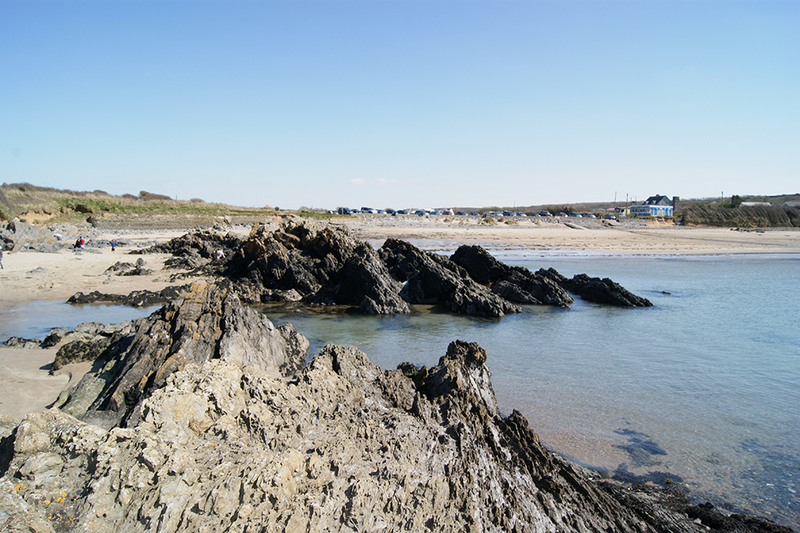 Angle beach has everything – sand, rock pools, space for kite-flying and a lagoon! Alec loved the treetop trail at Heatherton, especially the big zip wire; Hannah and Cheryl had a great horse ride at Marros; the cycle route from Green Arch to St. Govan’s Chapel is recommended and surprisingly flat! Hannah would like to live here because it’s “awesome”, and we’ve only just scratched the surface of what Pembrokeshire has to offer. So we will be back. THE SILK PURSE RULES. Had a great time! We loved the cottage. Couldn’t have wished for a better holiday – just wish we had booked longer. We all had a fantastic time. The cottage is wonderful with excellent views. Charlie loved the cows! We had some great days crabbing in Carew, fishing off the beach, excellent walks and fantastic surf at Freshwater West. We have had a lovely week. The cottage has been perfect. In the words of Arnie “We will be back”! What a wonderfully designed cottage with every facility you could wish for. We have enjoyed sitting in the beautifully secluded garden, watched over by the cows. We would love to stay here again. The cottage is beautiful. We’ve been very comfortable here and we’ve really enjoyed coming back to it each day. This cottage was perfect; the small touches make it very special. It is clean, very well laid-out and full of character. Nothing is missing. The beaches around here are fantastic, and the area is perfect for walking and photography. Thank you – we had a lovely time. 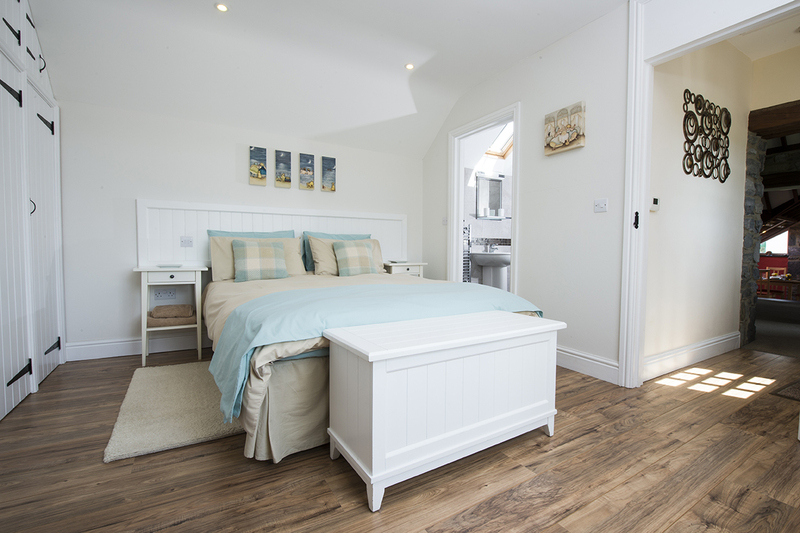 We’ve had a super week in this beautifully renovated cottage – the attention to detail is very special. It was good to see the original photos of how “Silk Purse” came to be. The weather has been glorious considering it is February and we have enjoyed walking areas of the coastline. 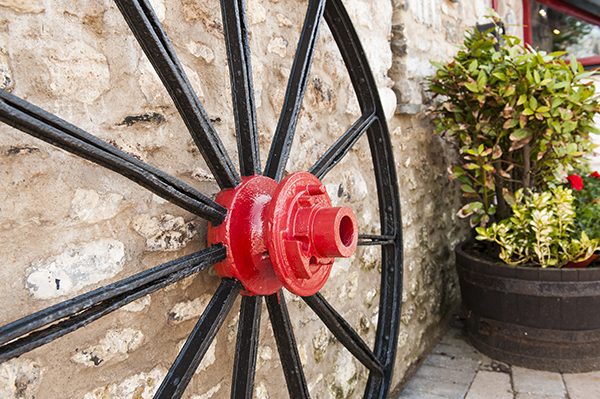 Angle is a lovely little village and we have enjoyed strolling to the beach and cosy evenings in the cottage. We have found a new entertainment this holiday - watching the cows. We have enjoyed a very relaxing holiday in this beautiful countryside, away from everything. Thank you for all your hints and a comfortable cottage. The cottage is beautiful. We've been very comfortable here and have enjoyed coming back to it each day. Our favourite places are Freshwater West beach - 10 minutes walk from the cottage - it's a shame the Harry Potter house has gone;Barafundle Bay, St David's Cathedral, Blue Lagoon (Joey, 9 and Laura, 7), Pembroke Castle and brass rubbing. 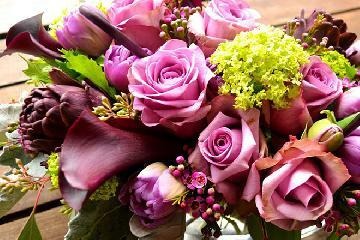 Thank you so much for Silk Purse. Great memories. Laura: It was very nice and smart. I liked the cows in the field, the ones behind the fence. The cottage is perfect. The small touches made it feel very special. It is clean, very well laid out and full of character. Nothing is missing. The beaches around here are fantastic, especially Barafundle Bay and Whitesands Bay near St.Davids. The area is perfect for photographing wildlife and views. Thank you - we've had a lovely time. We've had a super week in this beautifully renovated cottage. The attention to detail is very special. It was good to see the original photos and how "Silk Purse" came to be. The weather has been glorious considering it's February and we've enjoyed walking areas of the coastline. Angle is a lovely little village - we've enjoyed walking the beach and having cosy evenings in the cottage. Thank you. Had a fantastic time. Cottage is brilliant – very kiddie friendly, especially the entertainment provided by the “moo-cows”. Folly Farm is excellent for wet days. Sunday lunch at Stackpole Inn is excellent (booking advisable); tea and cakes at Stackpole Quay is delicious. See you again. Best holiday for a couple of years. A beautiful cottage helped to make our stay relaxing and enjoyable. Lots of lovely times visiting local castles and beaches, surfing, walking and having plenty of tea and cakes! Would love to return. Thank you. It was a great pleasure to stay in your very comfortable and unusual cottage. The weather being so good, we used Angle as a base to see all the special places nearby and we shall take home some very happy memories. This was our first visit to Angle and we have thoroughly enjoyed ourselves. The cottage is extremely comfortable and we had everything we needed. Angle is a very quiet and relaxing place and one day we hope to come back. Thank you for an excellent holiday. Great cottage, very well equipped. Attention to detail is important for a comfortable stay. Good to wake up without noise of traffic. Weather’s been good this week and we’ve had nice days out visiting different areas and beaches. Thank you for a lovely stay. We had a great week in a beautiful cottage, in a lovely village that we used to visit many years ago! This place is a real home from home; everything has been thought of. A perfect place to spend our holiday. Another year and another week in Angle. This wonderful cottage wrapped its arms around us and we enjoyed the peace and rest it gave us. As always, our friends in the village welcomed us back like only friends can. A wonderful cottage in a wonderful village. Many thanks. “Silk Purse” is a cottage to die for! The fittings, furnishing and décor are to an extremely high standard. We received the warmest welcome and the little extras were much appreciated. We have loved our daily early morning walks and have had the privilege of being invited to view the Lifeboat Station. We have visited everywhere from Wiseman’s Bridge to Solva and Whitesands Bay – but there is nothing, not even Barafundle, that compares with Angle. The West Bay and the East Bay are jewels. Even Chevron on a night looks fab! The local people are very friendly and nothing is too much trouble. We’ve had a fabulous week’s holiday. Had a great stay despite the weather. The cottage is quiet and comfortable with every facility. We have visited SW Wales many times and looked out some of the more difficult beaches like Skrinkle Haven and Barafundle. Marloes is much over rated, but Freshwater West and Broadhaven are excellent. Awaiting the day that Thorn Island is opened up. Many thanks again. We have had a brilliant stay. What a lovely cottage – it felt like home as soon as we arrived. Everything we could possibly want was here; and the cows have given us such a warm welcome! We have enjoyed Freshwater West with its dramatic seas and stunning views, Pembroke Castle and Carew Castle. Tenby has given us a couple of good days and we enjoyed watching the seals on the Seal Safari. The walk around Angle Bay is lovely. It is with great sadness that we head home leaving this lovely spot. This is a holiday we will always remember. Thank you. We have had a fantastic week. Had a lovely swim at Barafundle Bay – a beautiful place. We have loved our encounters with the cows every evening! “Silk Purse” cottage is gorgeous and very comfortable. Thank you. “Silk Purse” is a beautiful cottage. We have thoroughly enjoyed our week in Angle and we hope to be back soon. Visited many beaches during our stay – Freshwater West, Freshwater East, Angle beach and the beautiful Barafundle. Weather turned out to be great for most of the week and we got plenty of fishing in. The mackerel count must now be quite low in Tenby! The Swan Lake Inn in Jameston is good for meals and has a lovely beer garden. Thanks ever so much – hope to be back next year. A lovely cottage, very well equipped. A couple of days of sunshine – our 10month old twins enjoyed their first paddle in the sea. 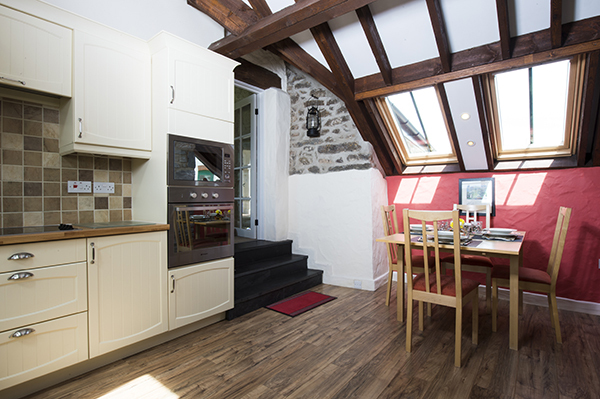 A fantastic cottage, beautifully converted and very well equipped. Super views and very relaxing. Saundersfoot and Barafundle beach – beautiful when the sun was shining. Stunning views from Manorbier and Freshwater West – looking at the surfers from the headland. Wish we could have stayed longer! Many thanks – hope to come back again. Lovely cottage, peaceful setting, changeable weather. Folly Farm was good for the young ones and the Blue Lagoon with its water flumes was great for everyone. What a fabulous cottage! Certainly the best we’ve ever had. So tastefully decorated and so much space. Zeta loved her runs on the beach after supper every night. We have had a great week with beautiful weather, lovely coastal walks, and just relaxing in this amazing cottage. We have had many trips to Angle – this was the best. Thank you. Had a fab week enjoying the Pembrokeshire coast. Lots of days sunning ourselves on the beach, catching fish and walking. The highlight of the week was seeing Russell Crowe on the film set for “Robin Hood”. The teapot pours well, the knives are sharp and the sculpture is awesome!! Many thanks. Nice wind down from the hustle and bustle of work. Had some lovely walks – the Angle walk was just about the right distance for us. Nice meals out – Stackpole Inn; The Dial in Lamphey; and especially The King’s Arms in Pembroke. “Silk Purse” is the perfect place to get away from it all. Thank you for the welcoming items. We’re reluctant to leave the cows, swallows, bees etc. Delightful. And everything works well. We’ve just had three full days here. A bus trip to Freshwater West and the coast path back. One day to Bosherston Lily Ponds late afternoon and a meal at the Stackpole Inn – excellent. Then a bus trip to Hundleton and the long trek back – much better than expected but some parts hard and dry. The new lifeboat was named yesterday, so glorious singing resounded round the bay. Thank you for sharing “Silk Purse” with us. How brilliant is this! Been coming to Angle for 50 years. I love this place – and here at “Silk Purse” it can’t be more perfect. Recommend: the Stackpole Inn for excellent food and service, the Harbour Inn at Solva too. Thanks for a fabulous holiday home; feel totally chilled. Don’t want to leave. The most perfect holiday – and the cows are a hoot! Hollywood moos!! Had a really super time, made especially enjoyable by the perfect holiday home. “Silk Purse” is truly a real home from home. We travelled around the coastline and our favourite beach was Marloes Sands. Misty, our cocker spaniel, particularly enjoyed it here! Thank you. We hope to be back next year. 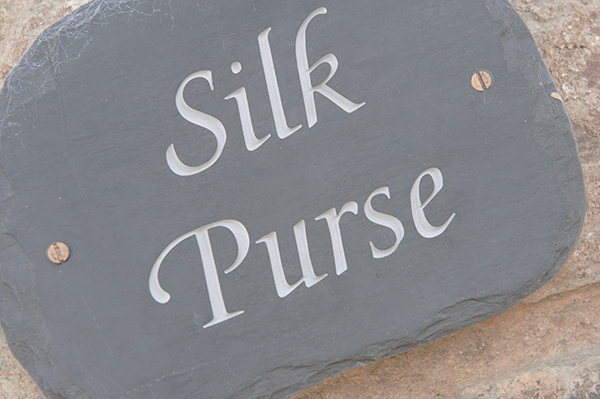 “Silk Purse” is such a lovely comfortable holiday home ……made of the finest silk!! We spent a glorious week walking the coastal path. Weather sunny and warm most of the week. Got to know some of the locals – lovely people and had a personal tour of the new lifeboat station. Hope to come back some day. Thank you. Super holiday, great location, excellent home. Thanks. Simply perfect. A stunning place in a wonderful location! We had a lovely time and hope to be back again soon. Thank you from all of us including Millie (the dog). We have loved our first visit to Pembrokeshire. ”Silk Purse” is a beautiful cottage in a lovely area. We have explored, walked, surfed and had an amazingly restful week. Thank you – we loved all the small touches and hope to be back. 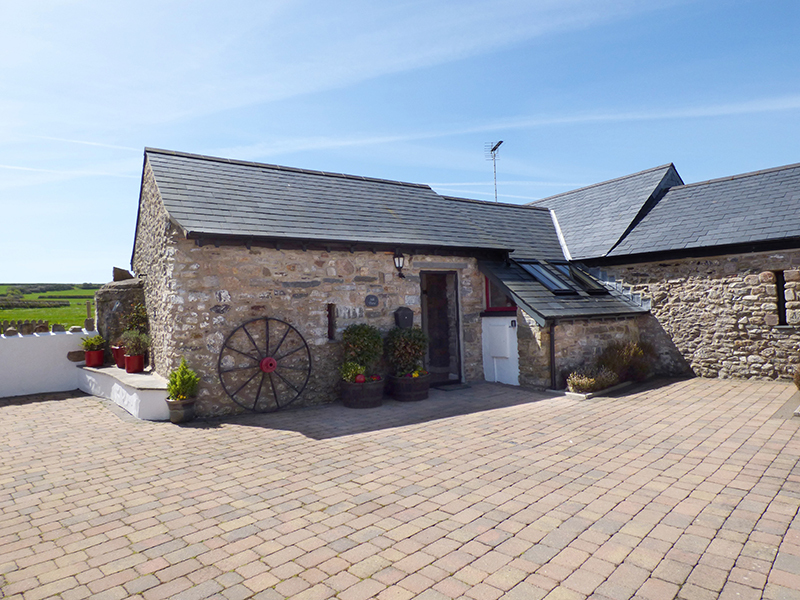 We have been visiting Pembrokeshire for well over 25 years. The best suggestion to anyone staying – just get out there and explore; you will find your own treasures! As for “Silk Purse”, it has been an absolute delight. We have so enjoyed staying in this lovely place. Wonderful attention to detail – thank you. 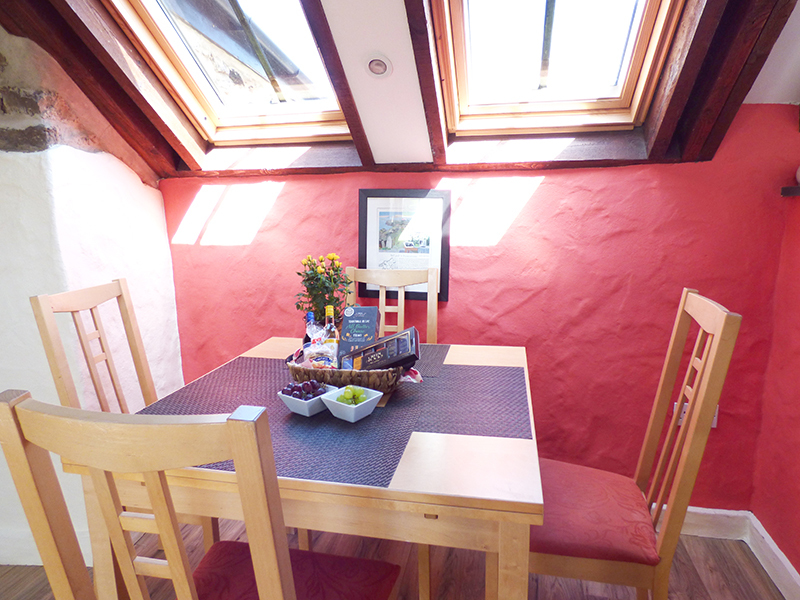 We certainly hope to book this lovely cottage again. “Silk Purse” is a gem of a cottage. It’s a real “home from home”. 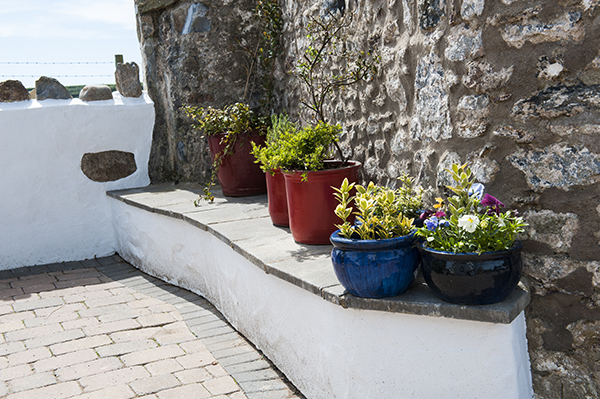 Angle is a super little place with a secluded bay, headland walks and village shop. Further afield we explored hills, Dale, coastal cliffs, beaches, sand dunes – and pub lunches. Pembrokeshire at its best. Amazing property with great attention to detail. We particularly like the brass sculptures/pictures. West Angle beach is great for rock-pooling and dam building. This is the first place we’ve stayed where the knives are actually sharp – and we’ve stayed in lots of properties. Tres bien! “Diolch byth am y bwthyn bach moethus yng nghanol wythnos aeafol a haf!” Thank heaven for this luxurious little cottage amidst a cold week in summer! Everything in “Silk Purse” is perfect. Even the children noticed, and enjoyed, the little details and the use of wood, stone and slate. Wonderful. Thank you very much. This Access Statement has been prepared by the owner for your information; it is the most recent version that we have received. This statement has been prepared as objectively as possible, however with such a wide remit oversights may be made. Please ensure all crucial requirements for a safe and enjoyable holiday are present so if you have any queries whatsoever, please do not hesitate to contact us on 01437 767600. “Silk Purse” cottage has two dedicated parking spaces adjacent to the front entrance, with an even ramped access to the front door. External areas to the front entrance are finished with smooth paviours extending approximately 80 metres down a shallow inclined private courtyard to the main street. On most occasions, where guests arrive between 3.00-3.30pm, the owner or a representative will be available at the cottage. No porterage is normally provided, but the owner can assist with luggage, and be available to meet guests at other times by arrangement. c] Two steps to access the utility room from the patio. A reasonably even lawned garden area has a continuous paved footpath along the rear boundary of the cottage. “Silk Purse” is a single storey cottage; however, there is an interesting, but restrictive, change in level between the area comprising the twin bedroom, shower room and kitchen/dining room, and the remainder of the cottage which contains the lounge, double bedroom, with en-suite, and hallway onto the patio. Doors and joinery are generally painted white, with most walls in either a cream colour or in natural stone. Silk Purse was converted from farm buildings in 2007/08 in accordance with the Building Regulations at that time. External lighting, activated by a movement detector, is provided for the front main entrance. The rear door accessing the patio and utility has external lighting. There is no telephone fitted, and mobile phone signals can be limited in parts of Angle. Teletext is available on the TV by remote control. There is a public bus service, which operates more regularly during the main tourist season. How would you like to contact us about Silk Purse? Please select from the options below by clicking the icons. Simply fill in our form and we'll get back to you as soon as we can. Our live chat is the perfect way to get an immediate answer to your query. Simply click here and our team will do all they can to help. Error! An account with this e-mail address already exists, please sign in. Note: Please select an end date to book, enquire or view prices. Notice: The property details may have changed for your requested dates, please click the button below to view the 2018 property details. We are unable to retrieve a price for these dates at this time, please enquire online or call us on 01437 765765. Looking to arrive in the next three days? Please call us on 01437 765 765 and we will be happy to help. Please Note: Due to the nature and size of this property, bookings can only be made via our reservations team. Please call us on 01437 765 765 and we will be happy to help with your enquiry. Please Note: This property combines the properties 43143 Inglenook & 43144 The Nook. Please call us on 01437 765 765 and we will be happy to confirm availability. Please Note: This property combines the properties 43442 Shell Haven & 43480 Shell Haven For Two. Please call us on 01437 765 765 and we will be happy to confirm availability. Please Note: This property can only be booked via our reservations team. Please call us on 01437 765 765 and we will be happy to confirm availability. Please Note: The owner of this property may require a bond, please check the property description for full details. Please note that this property has a preferred Saturday changeover day, to book a 7, 14 or 21 night stay online please choose dates that start and end on a Saturday. Short breaks are generally available starting and ending on the indicated changeover days. If your preferred dates are outside of these criteria then please do contact us online or call us on 01437 765 765 and we can carry out some checks on availability. © 1982-2019 Coastal Cottages of Pembrokeshire. All Rights Reserved.